It’s been another week where the seeds have been falling, left, right and centre although unlike Dubai, one of them has managed to avoid the apple cart of upsets to reach the final. Step forward the number eight seed, Carla Suárez Navarro who produced an upset of her own to take out Agnieszka Radwanska in the semi-finals, 6-2 6-0 in 62 (!) minutes. It was a surprising result, particularly as Radwanska had won their last match in Melbourne last month handily, 6-1 6-3 and Radwanska had played some sensational tennis to come from a set down to beat Roberta Vinci on Thursday night. While Radwanska wasn’t quite at the races, perhaps from the late finish the night before, Suárez Navarro produced a polished performance, finishing with stats of 21 winners to just 8 unforced errors. Suárez Navarro’s opponent in the final will be the 18-year-old, Jelena Ostapenko… I don’t think anyone saw this one coming! While Ostapenko clearly staked her intent in 2015, qualifying for the US Open main draw and reaching her first WTA final at the International event in Quebec City, her recent record on the WTA tour had been poor. After losing to Naomi Broady in Auckland, a dramatic match that she had multiple match points in, the young Latvian player had lost four of her last five matches. Arriving in Doha where she thought she would be in qualifying but made main draw after some late withdrawals, Ostapenko has blasted her way through the field, dropping just one set to Petra Kvitova and knocking out another seed in Svetlana Kuznetsova. Ostapenko benefitted from a retirement by Andrea Petkovic in the semi-finals (*sad face*); she won the last six games to win the first set, 7-5 with Petkovic retiring one game into the second set, clearly hampered by a leg injury… fingers crossed Petko is good to go for Indian Wells.
.@AndreaPetkovic retires after losing the first game of second set. 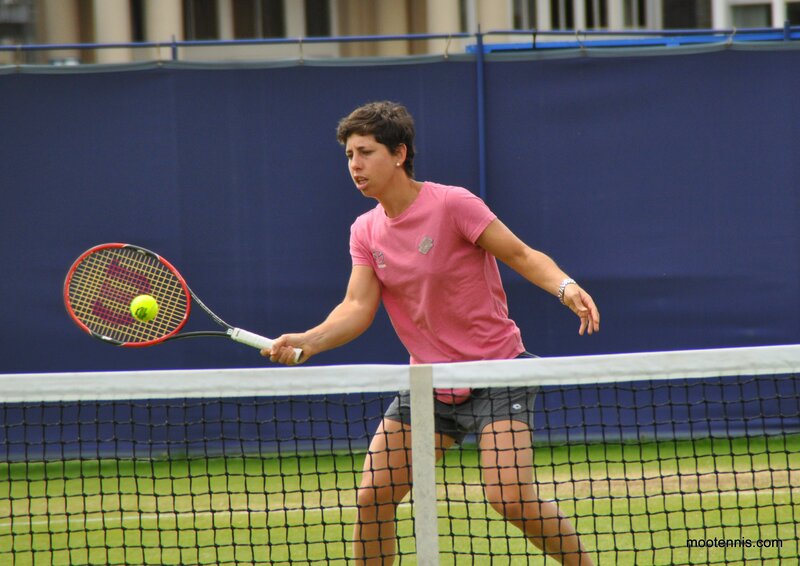 Head-to-head record: In their only previous match, Ostapenko thrashed Suarez Navarro, 6-2 6-0 in a surprising first round result at Wimbledon last year. Ostapenko was a wildcard having won the juniors title the year before. I was at Wimbledon on that day and remember coming out of court 3 and meandering my way through the crowd that had gathered as a jumping-for-joy Ostapenko made her way back to the locker room. I had been on my way to watch the end of the match and was flabbergasted to find that it had already finished! Final thoughts: While it’s by no means the final that anyone had anticipated, this has the potential to be a very interesting one. Suárez Navarro goes in as the clear rankings favourite as well as the player with the overwhelming experience in these situations. She will be eager to wipe away the pain of that first round loss at Wimbledon which had a huge impact on the second half of her 2015 season. I think this match will be a huge test of the Spaniard’s character. While she played great against Radwanska and has been super solid all week in Doha, there have been a number of occasions where she has failed to “get up” for big matches. February 26, 2016 in Doha, Ostapenko, Suarez Navarro, WTA. Ostapenko did play some good ball even though she would have been soundly beaten by Petkovic. Carlita for me, though it may be tough, she will have to defend very well against the hard hitting Latvian. Ostapenko will beat Suarez. She will hit really hard to overpower Suarez. Carla was playing on grass, her worst surface, the last time she played Jelena at Wimbledon. I think the match will be a lot closer this time but that Carla struggles against hard-hitting players so I’d still pick Jelena to win tomorrow although I’d be happier to see Carla win; she’s a great player but I can’t remember her winning a title ever though she made the final in Rome against Maria last year. P.S. I like Carla so I can’t pretend that I’m not happy she’s in the final but I still feel for Aga, she must be feeling horrible right now. What a comedown from the tennis she was playing to win yesterday to beat Robi, to then suffer a 6-2 6-0 beatdown the next day. It reminds me of when she played scintillating tennis in the last set of her quarterfinal of the 2014 AO against Vika and then went down 6-1, 6-2 against Domi in her next match (the semis). Easy 2:0 win for CSN. Ostapenko will make tons of errors when the balls will keep coming back and she’ll have to run all over the place after them. I saw Jelena play this week and I am not at all impressed by her game and it’s more of an accident that she got this far. CSN has the experience, skill and motivation to ask Jelena the right questions on the court. It doesn’t matter whether it is on the grass or hard court. The ball bounces exactly like playing on grass in Doha. It gives time or Ostapenko to place her shots just like how Suarez defeated Aga. If Ostapenko control her nerves and she does not activate her “Princess” mode button, she will take down Suarez. In addition, Ostapenko hits it really hard and deep, she won’t allow Suarez to move forward. Suarez has to make sure she won’t miss from the baseline. The final now depends on Ostapenko racquet. Come on Aljona Ostapenko!! Make Petra, Sveta, Zarina, Petko and Saisai proud!! I am picking CSN to win in 3 sets,it would not surprise me if the young Latvian player takes a set off Carla. I reckon Serena being at Indian Wells will boost the top players to perform. I think when she isn’t there then they all get a little anxious because its up to one of them suddenly. I also think Serena is winning IW this year. Losing the US and Aus Open titles will make her hungry to do well on the American hard courts here to stop the rot. These tournaments are losing money without top players. I see no signs up cheering on players. The seats are empty, the WTA needs another star besides Serena or Maria. Spot on! Yes it’s been a weird February but not sure it’s time to hit the panic button just yet. Indian Wells and Miami will be interesting for sure. I really like Ostapenko! I really felt that what happened in that match against Broady was unfair, considering that what Broady was asking for was incredibly unreasonable, and showcased how she wanted an easy out/win. Jelena, clearly, did not throw her racquet at the bb on purpose. With that said, her game is pretty good, and I really do hate CSN (most Kvitova fans do! ), so, fingers crossed, itll be a repeat of their first round meeting at Wimby last year. I think it is really unfair to say that you hate carla as most kvitova fans do. Really? By this logic, why don´t you hate ostapenko too? Everyone has their preferences, as do I. I really, really, really hate CSN. Can’t help it. Hmmm hate is a strong word and not sure how anyone can feel that way about Carla but each to their own! I very much doubt that Petra herself hates CSN (I’ve seen no evidence of it) or that she’d want anyone else to. What constitutes a fan anyway? I think Petra’s beautiful to look at and also a lovely person, but now that she’s won two slams I want someone who hasn’t won one yet, such as Aga Radwanska, to win one instead. Petra doesn’t draw in fans and sell out seats, she doesn’t have the it factor. She always looks like she is going to pass out and she needs muscle mass. There are no main attraction on the WTA tour beside Serena and Maria which is sad. If Venus sell out seats. Anyway, there’s another final being played today, in Acapulco, between Domi Cibulkova and Sloane Stephens. I’d like Domi to win again, not least because I think she’s a far better player than her ranking of no. 66 suggests and she needs the ranking points to move upwards, but Sloane’s clearly been playing really well (she beat Yanina Wickmayer yesterday, 6-2, 6-0) and I think she’ll be too strong for Domi. Sloane in two sets. I’d love for Aga to win a slam! it would be a tragedy if she didnt. I want Domi to win, too! she is an incredible fighter, with a fantastic game. All short tennis players should model their game on hers! I think she just might overtake Sloane, who can be super nervy during such matches. Sorry for no coverage this week of Acapulco! I haven’t watched any matches with everything starting at 10pm UK time! I also prefer now just to focus on one tournament rather than getting muddled with two. Interesting final, I think Sloane is the better player but Domi might tough it out. Well in the end lack of big match experience led the young latvian down but those who are into trading and not into straight gambling(hoping to make millions in just one day) must have made good bucks.Great match in the end , two contrasting ways of playing a final. With that jump into the players box CSN hopefully over leapt that defeat to Serena. I hope this is onwards and upwards. A good grinding win through the tournament. Match of the tournament for me was still Radwanska vs Vinci. It was like a throwback to all court tennis, different than what I normally see now. It’s exciting and soothing at the same time. Ooo yes 100%, wonderful match! This *could* be a big win for Carla, she showed a lot of character to come back in this final.